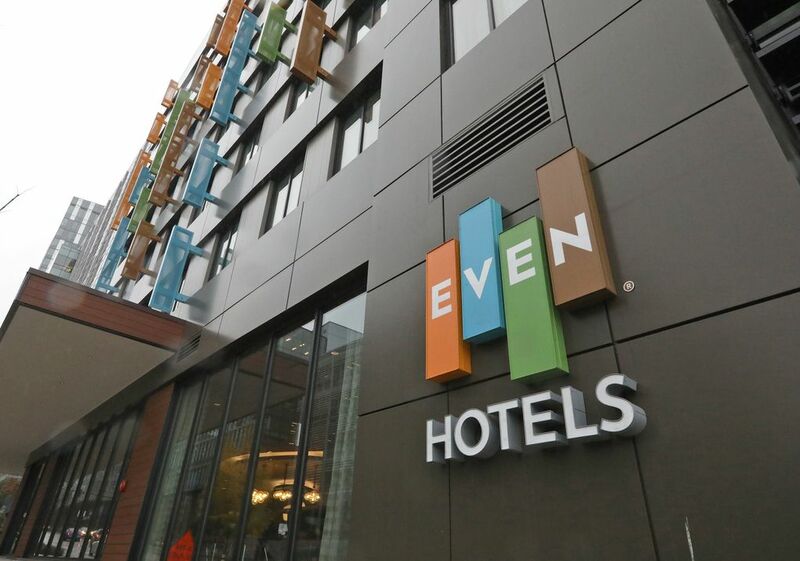 Seattle's hotel market has been on a record-setting run, with high demand and fat profits. Yet as a range of new players bring on as many as 3,000 new hotel rooms by 2021, it's far from clear how smoothly all that new supply can be absorbed. When it officially opens in December, the Hyatt Regency at Eighth Avenue and Howell Street will be both the largest hotel in Washington state and among the most closely watched. With its 1,260 rooms, spacious conference facilities, and proximity to the planned expansion of the Washington State Convention Center, the Hyatt is key to Seattle’s ambitions to play in the big leagues of the convention business and bid for massive corporate events that only a handful of American cities can currently handle. But the enormous property is opening just as the Seattle area’s hotel market — currently one of the hottest in the country — is cooling under a crowd of new entrants, from “limited-service” hotels to upscale boutiques and “lifestyle” properties such as the Marriott-owned, millennial-oriented Moxy in South Lake Union. By the time the Hyatt opens, Seattle’s downtown hotel market will have grown by a stunning 2,550 rooms since January 2017, or more than five times the number of rooms the city added in the two previous years, according to Visit Seattle, which markets the city’s hospitality and tourism sectors. Regionwide, there are roughly 65 new or under-development hotels across King, Snohomish and Pierce counties, according to CBRE, a real-estate investment firm. Hotel demand in Seattle remains remarkably strong, thanks to robust growth in tourism and business travel. That’s one reason room rates are still rising, though not quite as fast as before. A room in downtown Seattle averages $229, up 3 percent from 2017. More telling, the industry’s most closely watched metric, average revenue per available room (or “REVPAR” to hoteliers), has leveled off or even declined slightly since 2017, when it hit $187, said Patrick Smyton with Visit Seattle. That shift marks the end of the longest year-over-year growth streak since the 1950s, said CBRE’s Chris Burdett. The hiccup in Seattle’s hospitality sector wasn’t unexpected, given the realities of an industry where new properties can take years to build and where supply rarely matches up with demand. 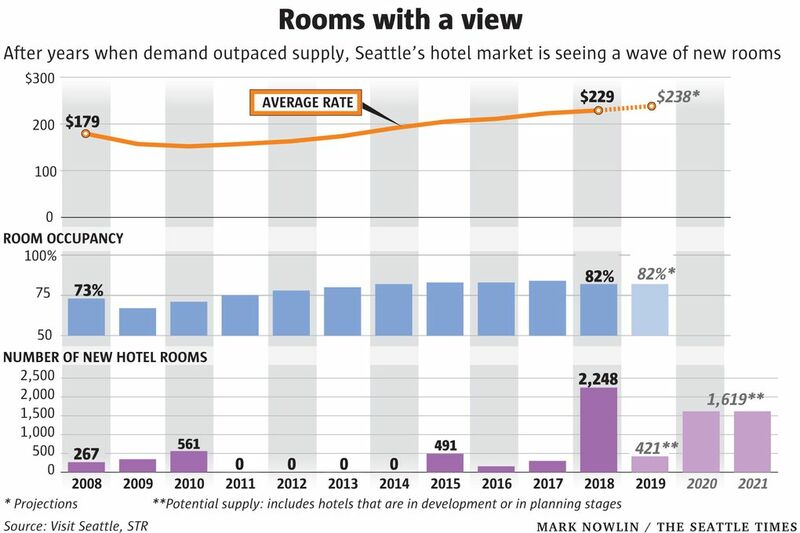 In Seattle, the recession largely shut down new hotel construction between 2011 and 2014, Smyton said — just as a tech-led recovery was boosting demand for hotel rooms. Between 2008 and 2016, annual downtown hotel stays jumped by 50 percent, to nearly 3 million, according to Visit Seattle. That supply-demand imbalance pushed occupancy rates above 80 percent, the threshold of an overheated market, which allowed hoteliers to lift room rates — and profits. But the good times couldn’t last. Those profits sparked a stampede by hotel chains, developers and big investors eager to cash in on the city’s hospitable hospitality sector. The result: a surge in new hotels. In the first half of 2018 alone, four major properties opened in Seattle, including the 282-unit Embassy Suites on South King Street, according to the Seattle office of Kidder Mathews. Various other projects are under construction or in the planning stages. By the end of 2018, downtown Seattle’s total room count will have jumped to 14,160 — a 21 percent increase since the start of 2017 — the largest increase since the first tower of the Sheraton opened back in 1982, Smyton said. Indeed, it’s the sharpness of the increase in supply that has caught the market’s attention. By 2021, industry watchers expect downtown Seattle could have between 3,000 and 4,000 new rooms, based on current and planned projects. “It’s going to take some time to absorb those rooms, simply because we’re not adding a lot of new demand generators,” said CRBE’s Burdett. Until demand catches up — which may not fully occur until the convention-center expansion is completed — occupancy rates will likely fall, experts say. How far they fall, and what happens on the way down, is a subject for debate. What makes forecasts so challenging is the complexity of the local hotel market. On the upside, the tech sector is still expanding, which likely signals steady increases in business-related travel. Tourism is on a tear. Case in point: The Port of Seattle expects 216 cruise ships and 1.1 million free-spending passengers to hit the city this year. That’s up around 10 percent from 2017, itself a record year. Also on the plus side, the region’s hotels may be more financially resilient today. Before the recession, many hotels were built or purchased with massive amounts of debt, which often proved disastrous when occupancy rates and room revenues plunged. “When people stopped showing up, [hotels] couldn’t service their debt,” said Howard Wright, a longtime Seattle hotelier whose firm, Seattle Hospitality Group (SHG), manages the 1,236-room Sheraton Seattle. Since the recession, added CBRE’s Burdett, many banks have required hotel developers and their investors to put up more of their own money, a shift that has reduced project debt—and, potentially, the risk of widespread default in a downturn. But the impact of other developments in the local hotel market is harder to assess. As in other cities, Seattle’s market has grown increasingly diversified, as hoteliers target ever more specific demographics with everything from high-end boutiques, like Hotel Andra at Fourth Avenue and Virginia Street, to “limited- service” properties like Courtyard by Marriott and a full range of “lifestyle” concepts. At EVEN, a 123-unit, wellness-themed hotel in South Lake Union (“Where style and serenity balance”), each room features exercise equipment and space for yoga. 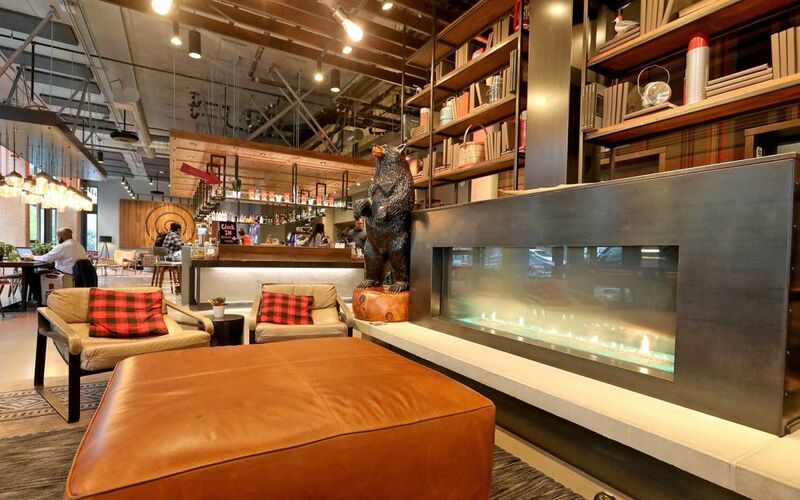 Nearby is the 146-room Moxy, geared toward millennials or the “young at heart”, where guests check in at the hotel bar and are greeted with a cocktail. In today’s tight hotel market, these niche properties have done well. 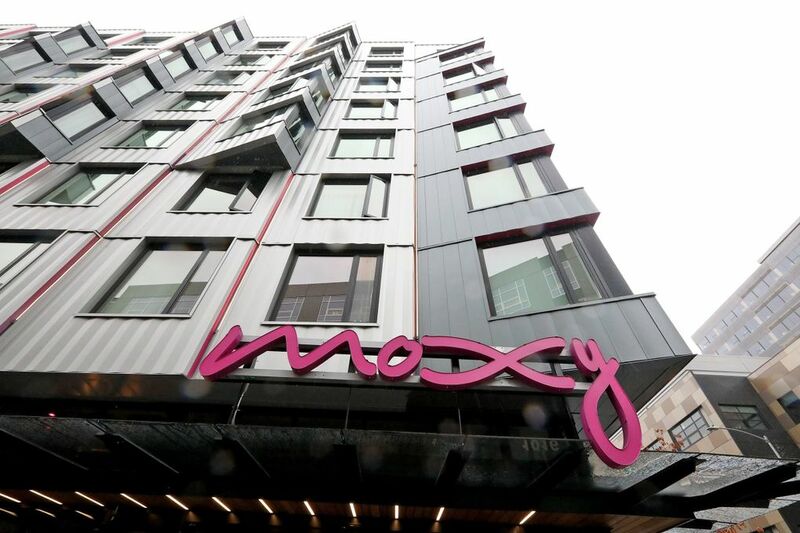 Moxy, for example, has benefited from overflow business travelers unable to find rooms in the downtown core, said marketing director Mick Ormiston. But how well these niche properties fare when today’s overflow guests can more easily find places downtown is hard to gauge. Similar questions arise over the “limited-service” properties that have popped up in outlying areas like Lynnwood, Redmond and the SeaTac area, as hoteliers capitalized on overheated downtown markets. As downtown supplies come back up — Bellevue, for example, will have added another 2,400 rooms by 2021, according to CBRE — some of these cut-rate hotels “are going to have issues,” Burdett said. Also unclear: how the Seattle market will be affected by various nontraditional players, such as Airbnb and other smaller but ambitious platforms. Among them, Spokane-based Stay Alfred, which leases up large numbers of units in new apartment buildings and turns them into short-term rentals — and which recently raised $47 million in new investment. Thus far, these digital interlopers have been stalled in Seattle by prohibitive new city regulations — but their strong appeal among certain travelers, such as vacationing families, means the disruptive threat they pose isn’t going away. In the near term, though, all eyes will be focused on more traditional players — existing hotels, but also new properties at various stages of development. These include the 250-plus-room Citizen M hotel in South Lake Union, a 142-room Hilton Sound in Belltown, and, of course, the Hyatt Regency, whose opening will serve as something of a canary in the Seattle hotel market’s coal mine. The Hyatt has been on the drawing board in one form or another since 2008, but construction didn’t begin until 2016, just as the city’s hotel market was heating up. Today, the Hyatt faces both an uncertain market and a convention-center expansion that, thanks to various delays, won’t be completed until spring 2022, eight months later than planned. Hyatt officials said “the slight delay” of the expansion “will not be an issue as we have so much of our own function space, so we are able to accommodate a lot of groups” without relying on the convention center. Other local hoteliers certainly hope that’s the case, as it will bode well for their own properties. But they’re waiting to be convinced. Seattle developer Kevin Daniels, who next year will open a 189-room luxury hotel and spa in his Mark tower project at Fifth and Columbia, said the city’s hoteliers are especially interested to see what happens with the Hyatt’s occupancy rates — and whether management has to “slash and burn” to keep the property full. “Everybody’s going to watch and see what happens,” he said. CORRECTION. The article has been updated with the new name for STR, the research firm providing industry data. The incorrect name was provided by Visit Seattle.